Guillaume Dufay (pronounce "GHEE-oam Doo-FYE", sometimes spelt Du Fay) (born Beersel? 5 August 1397? ; died Cambrai, 27 November 1474) was a Franco-Flemish composer and music theorist of the early Renaissance. He was the most important composer of his time. He belonged to the group of composers known as the Burgundian School. He had more influence on music in Europe than any other composer of the 15th century. From what it says in his will it seems likely that he was born in Beersel which is near Brussels in what, today, is Belgium. He was the illegitimate child of an unknown priest and a woman called Marie Du Fayt. When he was small, Dufay moved with his mother to Cambrai where they stayed with a relative who was a canon of the cathedral there. Dufay soon showed musical talent, and he was given a musical education at the cathedral. He sang in the choir there. When he was only 16 he was given a benefice as chaplain near Cambrai. He travelled to Konstanz for a meeting. From November 1418 to 1420 he was a subdeacon at Cambrai Cathedral. In 1420 he left Cambrai again, and worked in Rimini in Italy at the house of a rich family. In 1424 he returned to Cambrai because the relative in whose house his mother was staying was ill. After the relative died he went back to Italy. He worked in Bologna for a Cardinal. He became a deacon and then a priest. When the Cardinal was made to leave Bologna in 1428 Dufay went to Rome to work for the pope. He became a member of the Papal Choir. In 1434 he was made maistre de chappelle in Savoy. He seems to have left Rome when the papal choir had money problems. Yet in 1435 he was again in the service of the papal chapel, but this time it was in Florence. In 1436 Dufay composed the festive motet Nuper rosarum flores, one of his most famous compositions, which was sung at the dedication of Brunelleschi's dome of the cathedral in Florence. During this period Dufay also began his long association with the d'Este family in Ferrara, some of the most important musical patrons of the Renaissance. He may have got to know them during his first stay in Italy. Rimini was not far from Ferrara, and he spent time in both towns where he got financial support. At this time the arguments between the Pope and the Council of Basel continued. Dufay thought he might find himself without a job, so he went back to Cambrai. In order to be a canon at Cambrai, he needed a law degree, which he got in 1437; he may have studied at Turin University in 1436. One of the first documents mentioning him in Cambrai is dated December 27, 1440, when he was given 36 lots of wine for the feast of St. John the Evangelist. We do not know how long he took to drink it. Dufay stayed in Cambrai during the 1440s. At the same time he was also in the service of the Duke of Burgundy. While in Cambrai he worked with Nicolas Grenon on completely renewing the cathedral collection of music. This meant that he had to write a big collection of polyphonic music for services. He also worked in the administration of the cathedral. In 1444 his mother died, and was buried in the cathedral; and in 1445 Dufay moved into the house of the person who had been canon just before. He kept this home for the rest of his life, although he did spend six more years in Italy where he wrote many of his compositions. When he returned again to Cambrai he was made canon of the cathedral. He was the most famous composer in Europe by that time. He often composed music for the court of Burgundy, and he met many younger composers who were becoming famous, such as Busnois, Ockeghem, Tinctoris, and Loyset Compère. During this period Dufay probably wrote his mass based on the song L'homme armé, as well as the chanson based on the same song. Maybe he wrote this when Philip the Good called for a new crusade against the Turks, who had recently captured Constantinople. He also wrote a Requiem mass around 1460, which is lost. After an illness of several weeks, Dufay died on November 27, 1474. He had asked for his motet Ave regina celorum to be sung for him as he died, with pleas for mercy to be read between some of the movements, but there was not enough time for this to be arranged, so it was sung at his funeral instead. Dufay was buried in the chapel of St. Etienne in the cathedral of Cambrai; his portrait was carved onto his tombstone. In later years the cathedral was destroyed, and the tombstone was lost, but it was found in 1859 (it was being used to cover a well), and is now in the Palais des Beaux Arts museum in Lille. 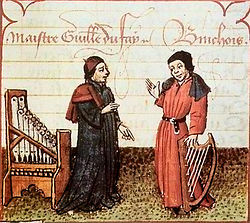 Dufay’s music was performed all over Europe. People who wanted to perform his music had to write it out by hand. There was no music printing in those days. Dufay wrote church music including masses, motets, Magnificats, hymns, simple chant settings and antiphons. His secular (non-religious) music includes rondeaux, ballades, virelais and a few other kinds of chanson. His style of composition laid the foundation for the next generations of Renaissance composers. Some of his techniques were old-fashioned. He used isorhythms in his motets, which had been popular in medieval music. He used a way of harmonizing chants which became known as fauxbourdon. He was popular because he was skilled at writing melodies which were beautiful to sing. This page was last changed on 9 March 2013, at 09:07.